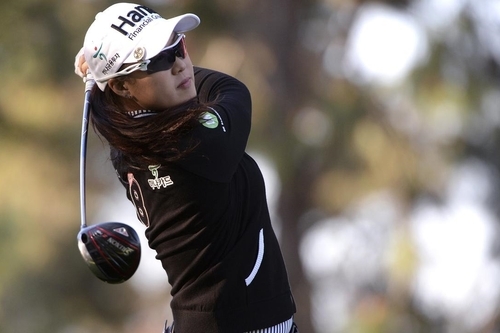 South Korean star Inbee Park has a one-shot lead going into the LPGA Tour's Kia Classic in California while Australia's Minjee Lee is seven off the pace. Five days out from the year's first women's major championship Minjee Lee has failed to capitalise on ideal conditions as others surged at the LPGA Tour's Kia Classic. The Australian star marked time with an even-par 72 third round to remain in a share of 15th, seven shots behind seven-times major champion Inbee Park, who led at 14 under after a 67 at Carlsbad, California. Seeking her 20th LPGA victory, the South Korean Park curled in an 18-foot putt at the last to be one shot clear of Japan's Nasa Hataoka, who charged to a 64, with Thailand's Thidapa Suwannapura (70) a further shot back. South Korean Mi Jung Hur produced a course-record 62 to be tied fourth at 11-under, making seven straight birdies on the back nine. World No.3 Lee had a shocking start of double bogey, bogey, bogey but fought back with five birdies before another bogey at the last halted her momentum. Lee will want a strong final day on Sunday before trying to win her maiden major title at the ANA Inspiration at Rancho Mirage in California from Thursday. Leader Park is is seeking her first victory in more than a year. "Just the feel on the greens is really good this week and I really want to keep that going tomorrow," Park said. "Hopefully, I can hit a lot of fairways and greens." The 20-year-old Hataoka won two LPGA Tour titles last season. "I started out playing really well, attacking the pins, and had a lot of par saves as well, good par saves," Hataoka said through a translator." Azahara Munoz (68), Gaby Lopez (68) and Mariajo Uribe (69) were 10 under. Lydia Ko, the 2016 winner, had a 67 to top the group at nine under, and Jin Young Ko (67) and Stacy Lewis (69) were eight under.